Theses are the team buzzer boxes which [Philippe Chrétien] built for his mother. She’s a big fan of quiz shows (we’re thinking Jeopardy and the like) and he thought she’d enjoy a proper setup for home gaming. Each unit consists of an arcade button and one LED, both housed in a project box. He uses telephone wire to connect each buzzer to the base unit. We like that idea since we’ve got a lot of old telephone cable lying around and our RJ-45 crimp includes an RJ-11 slot. This is perfect for making our own cables. The base unit houses an Arduino board which polls the buttons to see which is pressed first. The LED on the appropriate buzzer box is illuminated so the players know who got in first. One special feature of this setup is the ability to choose from 30 different buzzer sounds. There are several other quiz buzzer projects kicking around Hackaday if you’re interested. One of our favorites is this system which uses plastic bowls as the buttons. Another solution might be to use interrupts as well. 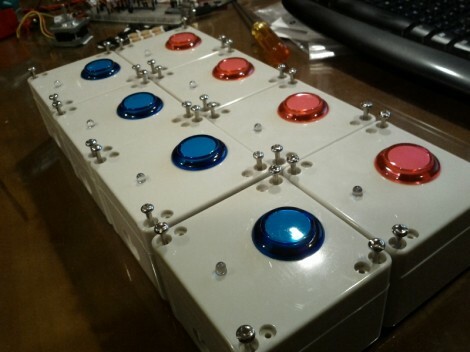 I’m really starting to feel like a shut in seeing projects like this where people actually get together and have fun..
Could you also set up each button with a different resistance and use only one input? Or would multiple button presses then confuse the program with response time if they were to close together? There’s always the Department of Energy National Science Bowl “Quizzer” system. Schematics provided for free here. Easily built for less than the $300 shown there if you don’t buy parts from Radio Shack. Anything that makes noise can be triggered by it for the buzzer or bell. I used the schematic at this site. Based on a 555 timer, I modded it with one 556 and just two buzz buttons. It works great!